All started with a dog that has proven to be a great turning point in our lives. This dog (Roxanne) was something we could not explain. I realized that she is not a simple dog. so different beyond the proverbial wrinkles. and my Vet said we must mate her. My logic saying that first of all we must find a healthy male to mate her. Not we are not that kind of people.... I gave the puppies and kept one of my favorite Zizel. want to have shar pei to find information and avoid bad things. I wanted to help the breed in my country because looking around it was full from Bad Hungarian Shar Pei(not all hungarian breeders are bad). The advice of our friend Dee Dee Wells was that we must get a very good male to mate the Roxanne and Zizel. She suggested me a friend of her in Italy who had a very nice litter. After two years of study and decided it was time to get a good male. From the six puppies that I saw my eye fell on Baci ... There was something different. I saw his mother, his father and was impressed, nice dogs with wonderful temper. I will help the pedigrees to escape from the poor Hungarian lines (there are also good lines but in Greece not). With Baci we began to part more and more to shows and educate our eyes. Things were pretty easy for Baci ... from his first show wins Best Baby Puppy in Show (all breeds). In all shows he was going he was winning everything. 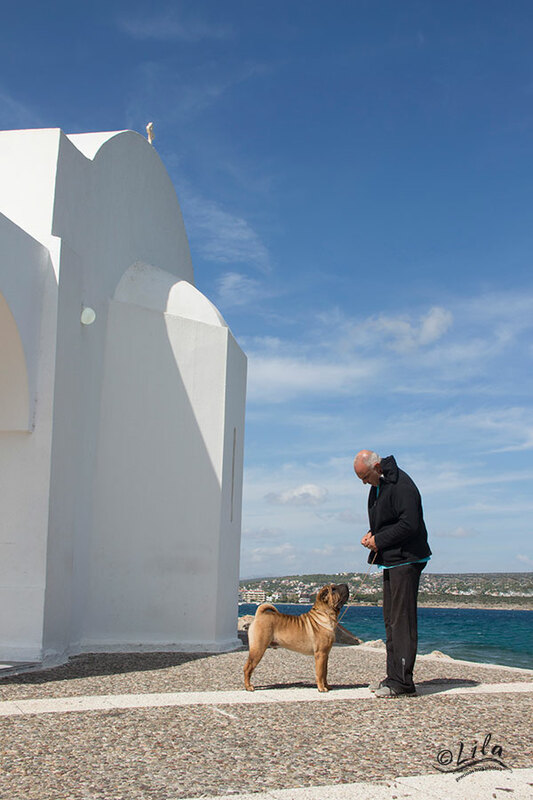 He is the only dog in Greece that he had win all categories BIS in every life stage from baby to adult. With Baci we stuck to the good of the bug for dog shows and because we like long trips we saw it as an opportunity to find excuses to travel worldwide. The search and the need to meet people who have played a key role in the evolution of the breed. 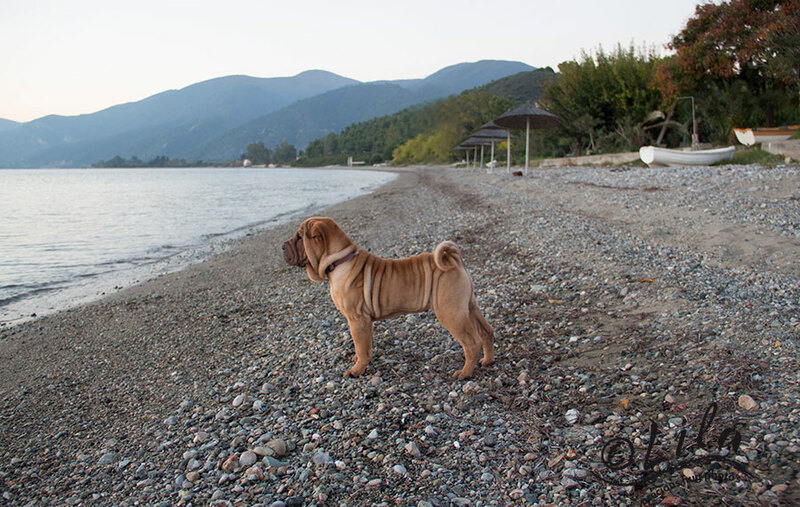 He made us want to go to attend in Shar Pei specialty also because in Greece there was not many Shar Pei. My friend in America told us that he would go to attend as a guest at a spesialti in Slovenia. Official would be invited Matgo Law the man who saved the race that we cherish today. I saw it as a great opportunity to learn more to meet the world and the most important people in the breed and see many dogs. and what impressed us even more was that Baci at the age 9.5 months she won the title of Best Male! The joy was great and the bug reports of dogs came even more into our lives. It was a great school that trip the speech and the meeting with Matgo Law . 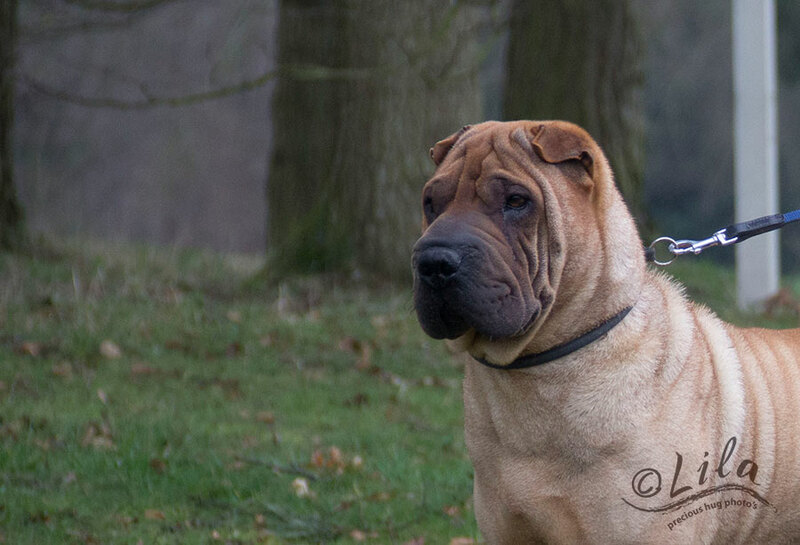 I heard and saw with picturs by first hand the history of shar pei. 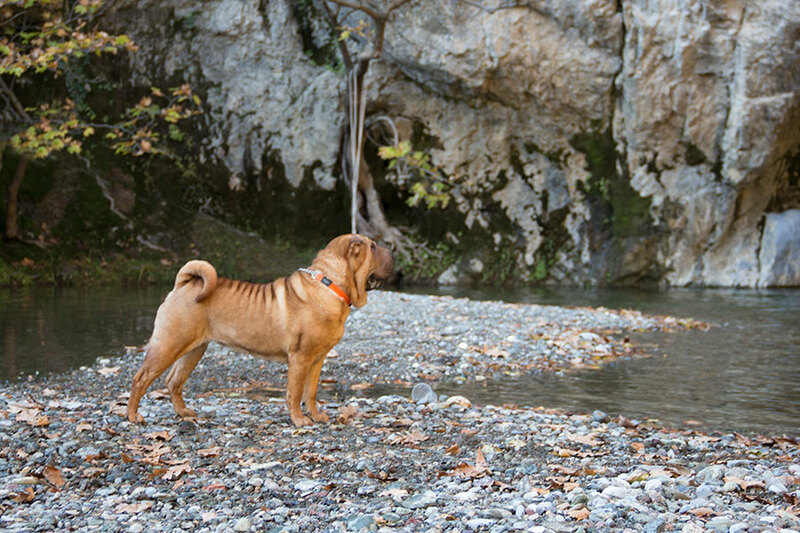 After Slovenia we began some of trips to study the breed and of course to study morphology (there is not better way to watch over Shar Pei with 100-140). I joined the biggest Shar Pei Club of the world watching births, lines. Soon understand what type of dog I like and what kind of dog I would like to use. Next step was to find a good male for my girls to keep a female and mated to the Baci. I had great help from my friend Isabella Pizzamiglio in Italy. 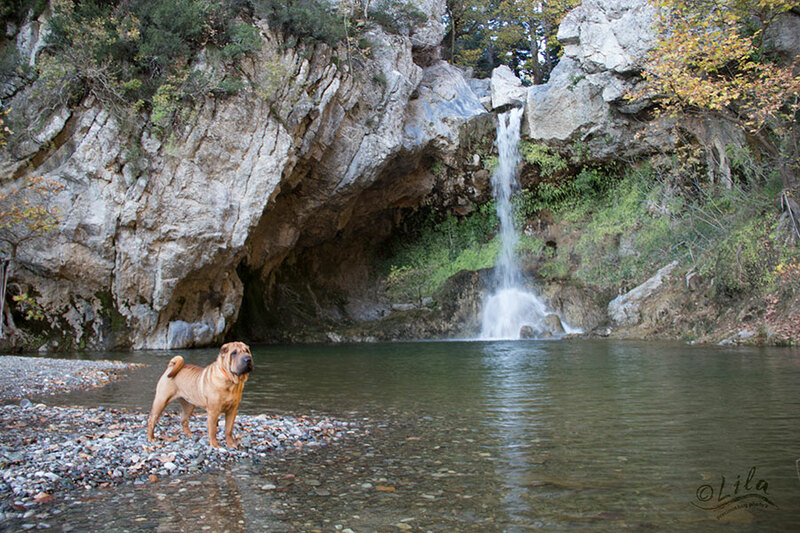 She give me a dog in Greece a legend in this breed from a great American blood lines. I went to Italy to get the True (KHAMBALIQ MARGEM TRUE STYLE) to be mated with Zizel. My friend Stelios told me to mate also Roxanne to keep this line in Greece. I chose the name in a minute ... the question to myself what are the dogs for me ... and of course a precious hug. we were like zombies ... we decided to quickly get another dog but we wanted to be from the same father. I flew to Italy the same day and brought home our Scaly. I put to the mom .. Roxi did not want her... but it was impossible to eat because she was too weak ..
For days used to collect milk from the Roxanne and feed her every 2 hours. There Fibi opens a new chapter in our lives a wonderful dog. We have done so far many litters in our home. We have 18 dogs living with us in our beds, the couches, our puppies grow with us with hugs and kisses. Parents looking for dysplasia, have clear eyes and of course our dog nobody has done surgery in the eyes. 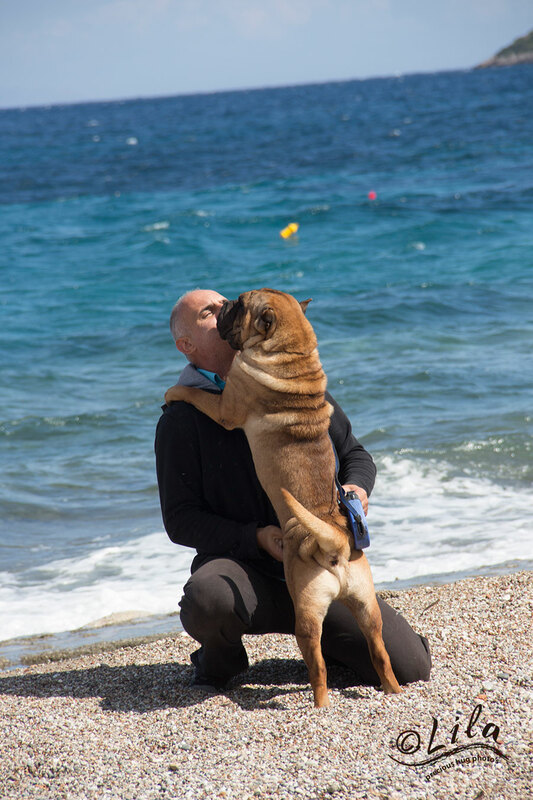 We give a Shar Pei in South Africa, America, Sweden, Belgium, Spain, Cyprus, Austria, Italy (not ordinary dog owners but breeders). And our dogs have excelled results all over the world. All this of course would not have succeeded without Dee Dee Wells, Isabella Pizzamiglio, Susanna Björnsson ...., George Kostopoulos and Stelios Makaritis. PS: With some people maybe now we do no thave the best relationship in the world but... not matter what i can not turn my back to the fact for a period were very helpful to us.